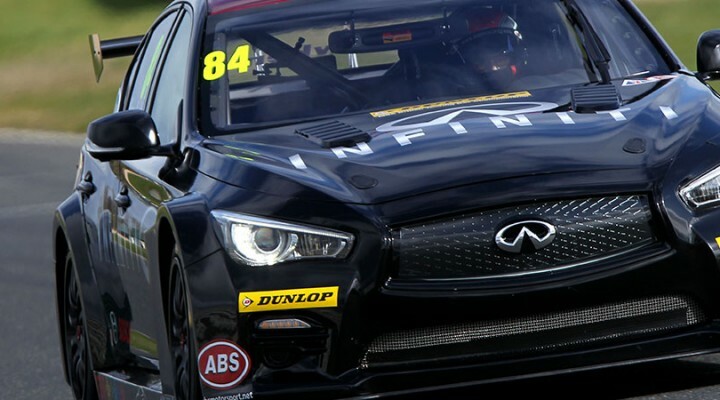 Infiniti Support Our Paras Racing heads to Donington Park this weekend for the Dunlop MSA British Touring Car Championship with both its Q50 race cars ready for action. A fortnight after Lesmahagow’s Derek Palmer debuted the first race car at Brands Hatch, notching two impressive top 20 finishes, the 28-year-old Scot is joined by team-mate Richard Hawken. The 42-year-old from Walton on Thames sat out the season opener, but will now take his place on the grid for Sunday’s BTCC triple-header. The Mallory Park-based team’s Infiniti Q50 race cars are prepared by injured ex-servicemen from the Parachute Regiment, with all team profits being donated to Support Our Paras, the official Regiment charity. And Palmer admitted he’s targeting his first championship points in Sunday’s high-speed triple-header at the Derbyshire circuit. “Yeh, that has to be the goal really,” Palmer said today. “That’s what I really want to do! Of course it’s going to be tough, but we showed at Brands that the team is capable of delivering improvements throughout a race weekend. Hawken meanwhile is looking forward to making his full BTCC debut this weekend. How important to you was it to get three BTCC races under your belt at Brands Hatch? I think it was very important for us to do that. We went into the weekend with the idea of getting as much running in as possible. With such limited testing going into the start of the season, we wanted to learn more about our car and the package we have produced. We achieved this and also had great reliability with only a small power steering issue in race one. I think looking to Donington we want to see another big step forward with the car and ultimately move further up the grid. Was the step up to the BTCC more challenging than you had imagined? I know how tough the BTCC is and how good you have to be to get into the mix, so it was what I expected being honest. What really impressed me was the whole team effort that was put in to make the race weekend a success. We jumped in at the deep end and everyone made a very professional job of it, even when they were under immense pressure in a very stressful situation: but I suppose that’s what the Paras excel at, so I shouldn’t really be surprised at all! Your times improved impressively through all sessions at Brands Hatch, ultimately delivering two top-20 finishes: are points a possibility at Donington? That has to be the goal really. That’s what I really want to do! Of course it’s going to be tough, but we showed at Brands that the team is capable of delivering improvements throughout a race weekend. If we continue doing that, and we get the rub of the green, then yes, points are a possibility. What race experience do you have of Donington? I’ve raced there quite a few times in British GT, single seaters and historics. I love the circuit and I’m excited about the weekend! Finally, can you sum up the level of work and commitment the Paras achieve in preparing your car. I don’t think the boys ever stop when we are back at base. I leave and come back and they are still there: they’re machines! They are completely dedicated to it. They know, as we all do, that we have a massive learning curve and a mountain to climb to achieve our ultimate goal, but we are just all working as hard as we can to scale it as quickly as we can. This is where it’s great to have partners like Infiniti to help us with the task and also bring their experience and insight into the project. It’s hard for me to put it into words. The only thing I would encourage anyone to do is stop by the Infiniti Support Our Paras Racing garage at Donington Park this weekend and see them in action. Believe me, you’ll be impressed. How have you prepared for your debut in the BTCC? The BTCC is a tough championship to both get in to, and compete in, so over the winter I undertook a very serious fitness campaign with the help of a personal trainer: that has prepared me physically, plus helped shed a further 2kg. Mentally I have for many years visualised racing in the championship for the first time, but I still think when the lights go out on Sunday there will be an enormous rush of nervous excitement. Acknowledging the step up from Club Touring car racing into the ‘Premier League’, I have also spent valuable time with a driver tutor and a few sessions with a professional sports coach (a friend’s father) to get the ‘head edge’. I think no matter what you do, nothing can prepare you enough though. How difficult was it to sit-out the opening race weekend at Brands Hatch? Sitting out Brands Hatch was tough for many reasons. Firstly it’s my local track, as I live in Surrey 45 mins away; secondly it’s the circuit I have had the most poles, most outright wins and most fastest laps on in the Super Touring cars I raced. So when you’re confident and you lose your seat for that race it becomes very tough indeed to handle the rush of emotions and disappointment. Hopefully it’s not an experience I will need to relive again in my racing career. How challenging do you expect the step up to the BTCC to be? It’s the BTCC, so no matter how much you probably think you’re ready, there’s always the unknown. Having raced classic Super Touring cars where we are all owner-drivers of these fantastic machines, we try not to damage them by staying 1-2 cms apart. The BTCC drivers make a car fit into a bicycle-sized hole, so I think when we start mixing it up as we progress through the pack, the physicality of it will be quite challenging to deal with. I just need to learn to give as good as I get. First time out: what’s your expectations for Donington Park? Essentially, Free Practice 1 will be getting used to the feel of the car, as well as collecting critical data for the engineers to work with. FP2 is where I aim to start nibbling time out of the lap as we prepare for qualifying in the afternoon. Ultimately I am a racer, so I want to do as well as I can. However, being a debutant and not having had the experience from the first race weekend, or testing for that matter, I am looking to finish all three races well, hopefully without drama. If I can break into the top 20 I will pat myself on the back and consider than an achievement for my first weekend. I have raced at Donington a number of times over the years with the BARC and BRSCC, visiting the podium more than once. My first experience of the circuit was in a RWD Thundersaloon, so I’ll be digging deep to retrieve those experiences. Latterly was with my Vauxhall Cavalier and Nissan Primera Super Tourers. For me the circuit’s up there with the best of them, alongside Brands Hatch and Oulton Park. I enjoy the sweeping high speed bends combined with the necessary technical precision to nit a decent lap together. Last time out at Donington I broke the Nissan’s gearbox and only had the top three gears, yet still managed a podium. I have the whole team to thank for their total dedication in preparing both Derek’s and my Infiniti Q50 race cars for Donington. The Paras are such a tenacious, motivated bunch and no more perfectly illustrated than seeing them working on race cars … our race cars. Eighteen hours a day is a feat for a regular person, let alone one who has suffered injuries, yet nothing stops these guys and nothing phases them. It’s just incredible to be a part of, and learn their ethos. One thing I have learned from the Paras recently: always know the job above you and step in when necessary.